European brown bears are shy creatures and difficult to observe in the wild. Although extinct in Britain since around 500 A.D., healthy populations still exist in Scandinavia, and one of the best places to see these impressive animals in the wild is in the remote forests of Finland. 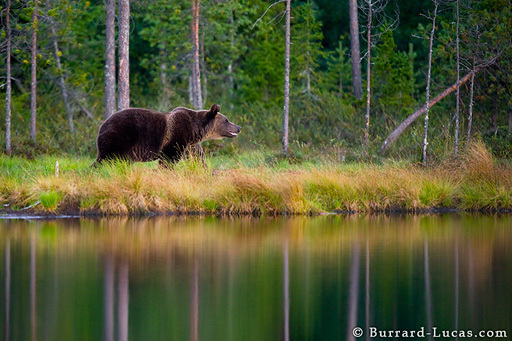 We photographed this bear from a small hide on the edge of a lake. The calm water reflected the trees behind, creating a scene that resembles a watercolour painting.